This report publishes the timetable for scheduled backup, replication and backup copy jobs. The Jobs Schedule chart displays the total number of jobs running according to the specified schedules. The Protected VMs chart displays the total number of VMs protected by backup, replication and backup copy jobs. 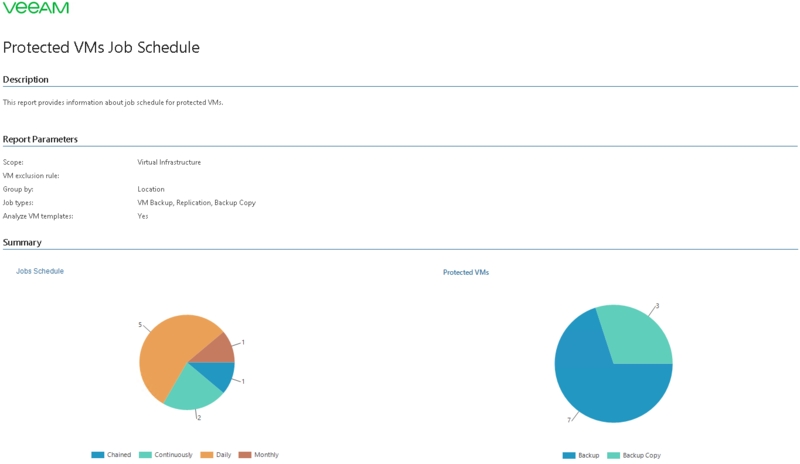 The Details table shows VMs included in the jobs, scheduled run time and date, recurrence intervals, weekly full backup schedule for backup jobs and the effective backup file retention policy. This report helps you ensure that applied data protection job schedules are configured in accordance to the backup policies and allow you to meet the desired RPO requirements. Job Type: defines a job type that should be evaluated (Backup, Replication, Backup Copy or All items). Exclusion mask: defines a list of VMs that should be excluded from the report scope. You can enter VM names explicitly or create a wildcard mask by using the asterisk (*) to replace any number of characters. Multiple entries are separated by semicolon. Usage example: the following string will exclude machines with the _R&D suffix from appearing in the report: “*_R&D”. Group by: defines whether data in the report output will be grouped by Location, Schedule or Job type. Include VM templates in this report: defines whether VM templates should be included in the report.